During my time in the library, I came across a book written by a Swiss doctor, Catherine Kousmine, who suffers with psoriasis. She wrote the book after years of research, and said the most important part of coping with the disease requires the affected person and their family members to accept it and come to terms with the fact that no cure currently exists. Some time after reading this book, I came to accept my psoriasis and was overcome with relief. I started to swim and play sports again, no longer caring about other people’s stares, questions or thoughts. 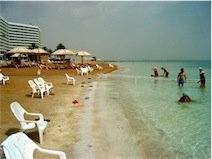 Since discovering this treatment, I developed a desire to go to Israel, to the Dead Sea, for therapy, but at the time, years ago, I could not afford this trip. The sea, located in the middle of the desert, was served by fewer than twenty hotels, the cheapest of which cost $160 a night, plus airfare. This is not too expensive if you go for only a week, but the doctor recommended I go for an entire month. Finally, in 2006 I made the trip, which I will share with you elsewhere on my website, along with more affordable traveling options. It was a great pleasure to introduce myself, and I really hope my experiences help you in your struggle with psoriasis. Just remember, before you start or stop any treatment, always talk to your doctor or specialist. All the best, Albert B.